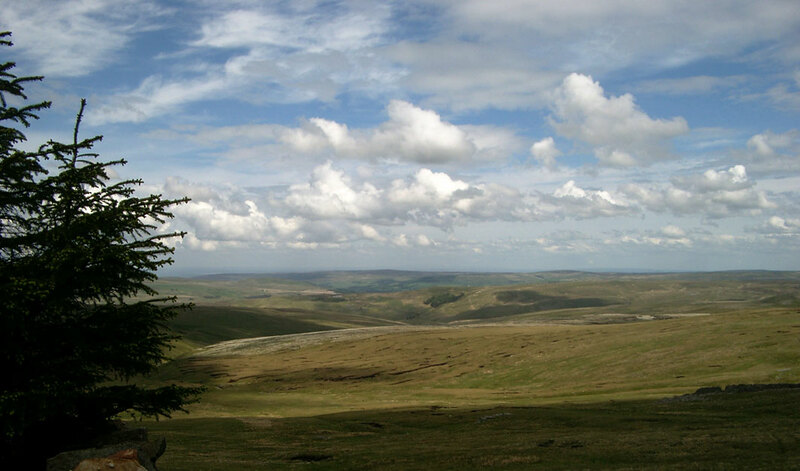 The Cheviot Hills: first day of the Pennine Way. Click on the photos to enlarge. I had really wanted to get this section over with on a weekend over the winter, but Kirk Yetholm is quite inaccessible from the Isle of Man and it never proved practical. 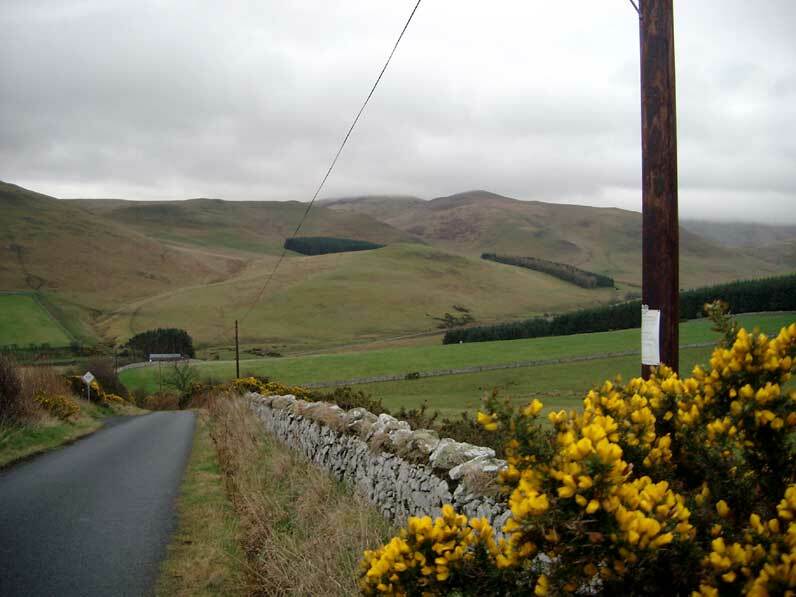 As you need to allow at least 10 hours for the walk to Byrness, midwinter is not a good time to try and find a calm day with plenty of daylight, so even taking a long weekend off would not have been any guarantee of a straightforward crossing of the Cheviots. So I found myself at the Border Hotel again on the evening of 8th April, stocking up on carbohydrates in anticipation of a long, hard day. The Hotel was a good place to do this, with a comfortable but informal atmosphere, good rooms and decent food and drink. As the car has Manx number plates, I was welcomed by a regular who'd spent some time working on the promenade at my home town of Port Erin and who'd noticed the plates. The few locals at the rather quiet bar that evening were avidly watching the Newcastle United v. PSV Eindhoven match on the hotel TV, and the number of Geordie accents around made me realise that the area has almost as much in common with the North East of England as the South East of Scotland. I found it difficult to manage a big cooked breakfast in the morning, as I was apprehensive about the day ahead. The weather was not co-operating, with light rain first thing and low clouds over the hills. After what seemed an eternity of preparation, I set off across the village green and up the hill, the gentle tarmac start being a welcome opportunity to get into an early rhythm. The Border Hotel, Kirk Yetholm. 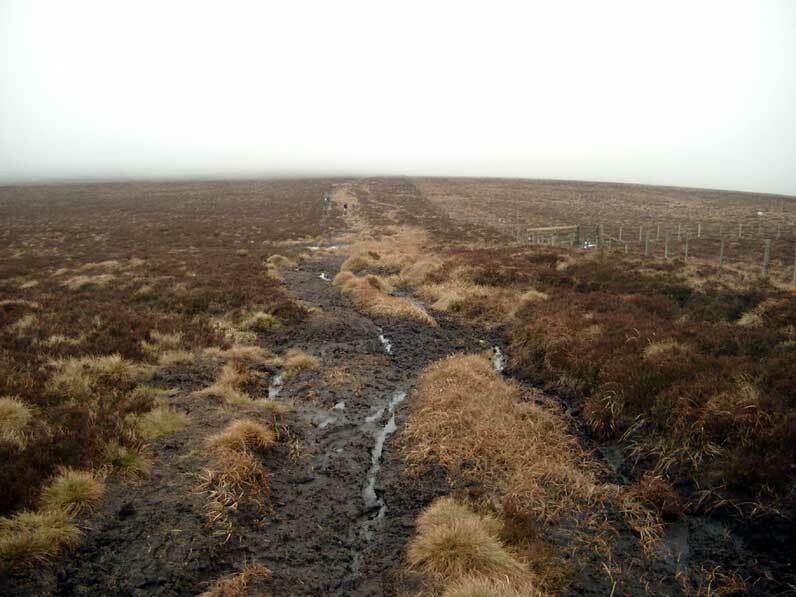 I'd intended to use the Alternative Route, which stays in the Halter Burn valley until forced up onto the Cheviots between Black Hag and The Curr. On reaching the Pennine Way signpost a mile from Kirk Yetholm, the Alternative Route was not signed, and I instantly felt that the more challenging main route was going be the most satisfactory (at least in retrospect) as the Halter Burn valley may not even contain the genuine Pennine Way any longer. So I forded the burn and struck off up the first of many punishing hills. White Law was a steady grind, which I took at a good pace. the summit gave a great view of the way ahead as it was clear at this level, unlike the mist over the hills to the south. 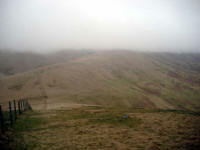 Steer Rig was the next hill: a boggy ridge leading to the side of Black Hag, where I met the cloud at about 1500 feet. The first paved section was around here, as the peaty ground was quite damp and easily eroded. I decided that the stone flags were welcome, as even though they are hard on the feet they allow fast, dry progress rather than the awkward bog-trotting that would have been the alternative. The Schil was next on the agenda - a more serious climb this time with a long steep section near the summit but with interesting rock formations looming out of the mist to relieve the monotony of grey cloud. tussock grass and dark, peaty ground. Down the other side of The Schil, a long boggy section led to a sudden steepening: the side of Auchope Cairn. Only seven and a half miles into the walk, I didn't want to burn up too much energy so I had a good drink of water and set off slowly - there is a rise of a thousand feet from the ridge to the summit. I was soon overtaken by three young walkers: one seemed to be carrying everyone's camping gear in a massive rucksack whilst the other two were lightly burdened. 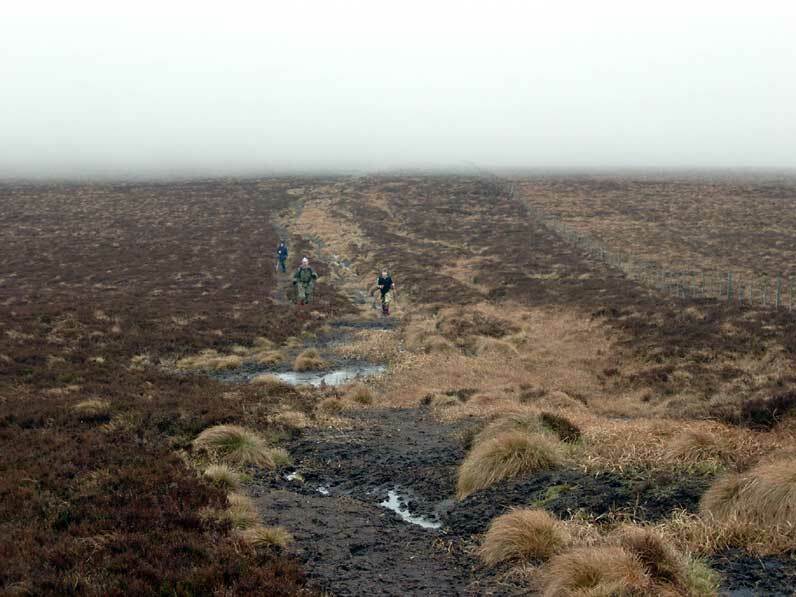 The girl in the party was wearing training shoes which were clearly absolutely saturated, and they said they were heading up The Cheviot - a notorious peat bog. Although they had a much shorter day ahead, I didn't fancy The Cheviot in trainers, in fact it wasn't a very attractive idea in boots, either! 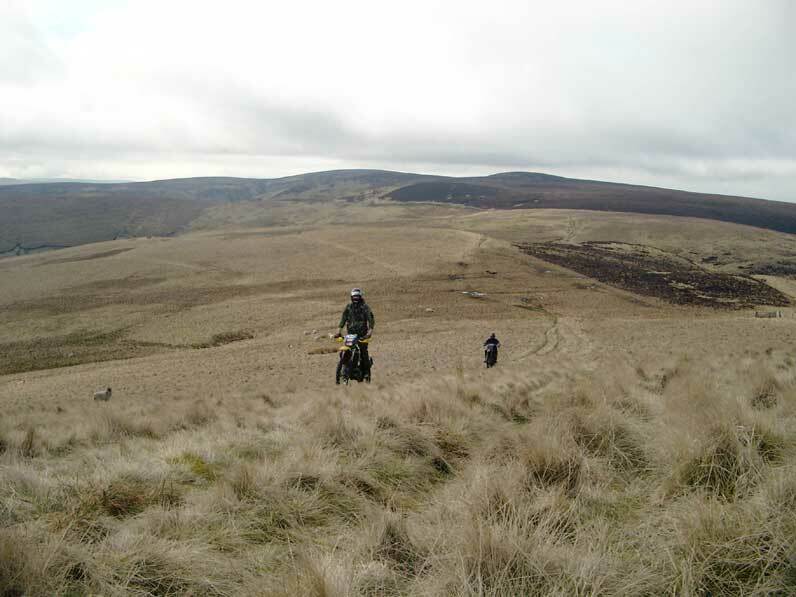 The Auchope Cairn climb begins steeply, and gets even more steep towards the top. 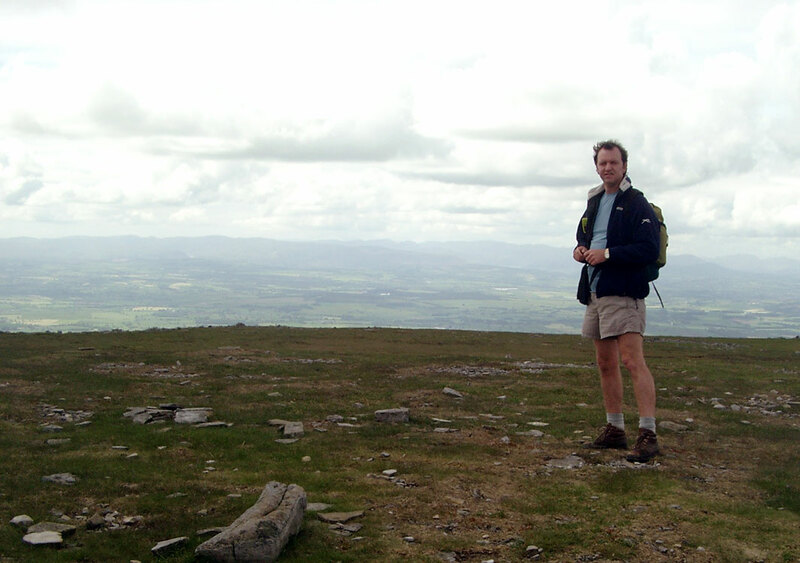 Although reasonably fit, my lack of recent hillwalking practice began to tell as I slowed badly for the last few hundred feet - my hill-climbing muscles had had enough for the day. Eventually I reached the summit, although there was little relief until the next small summit half a mile further on at an altitude of about 2500 feet. 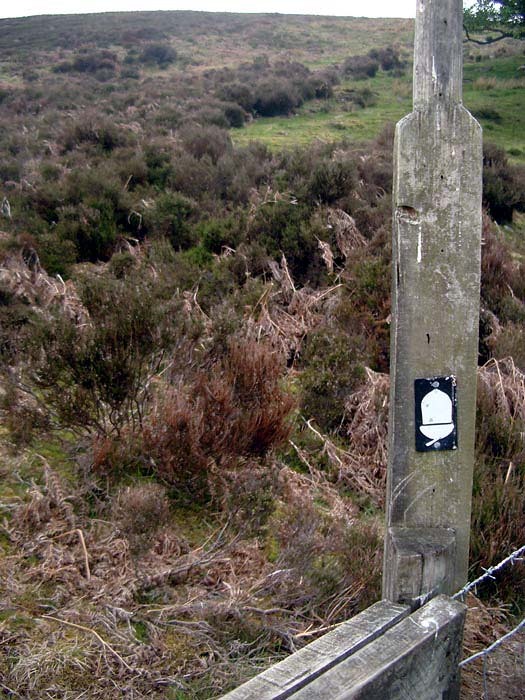 This small hilltop has a marker post for the Cheviot option, which would add a miserable two and a half mile round trip across the Cheviot peat bogs to see an Ordnance Survey pillar in a misty mire. Not today thank you! 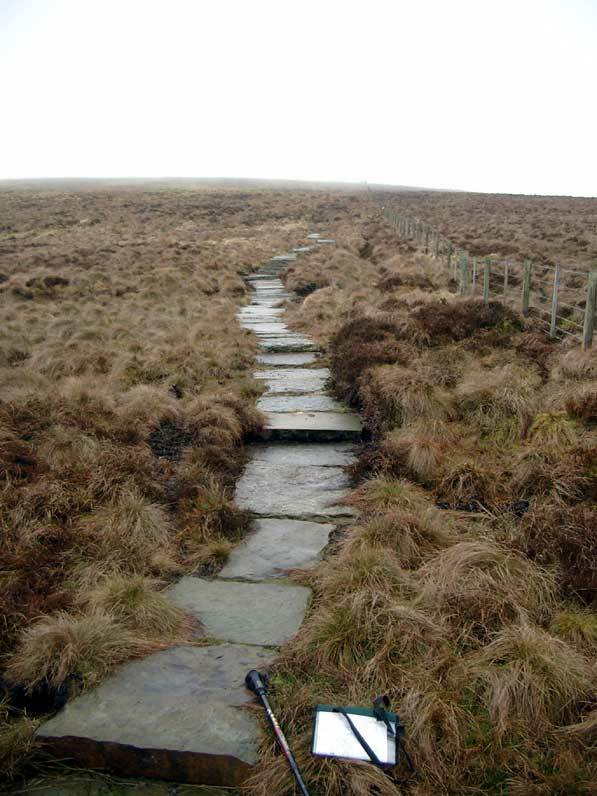 I moved on quickly, legs back to almost full strength and the way marked by excellent wooden walkways and stone flags through peat hags and patches of snow, gloomy in the murky weather. This first long downhill section, though dull in these conditions, was very enjoyable. 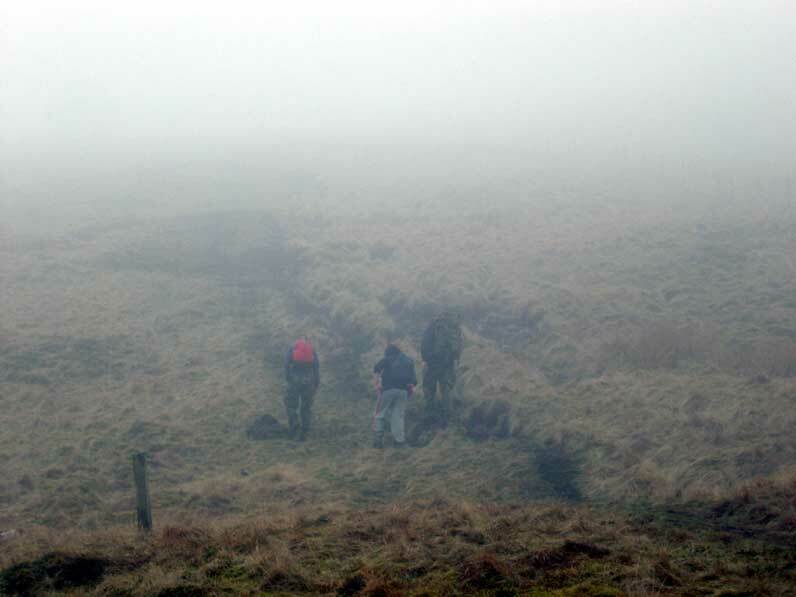 After Score Head the mist began to lift - a view of distant hills appeared, and lighter patches on some of them promised clearer weather. 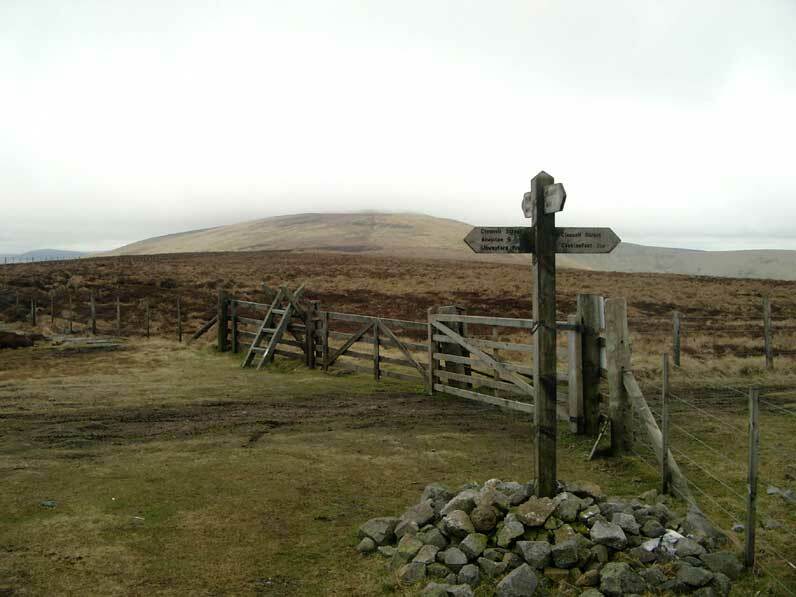 The ridge from Score Head to Windy Gyle is three miles of rough ground, sometimes aided by flagstones but often boggy and difficult. 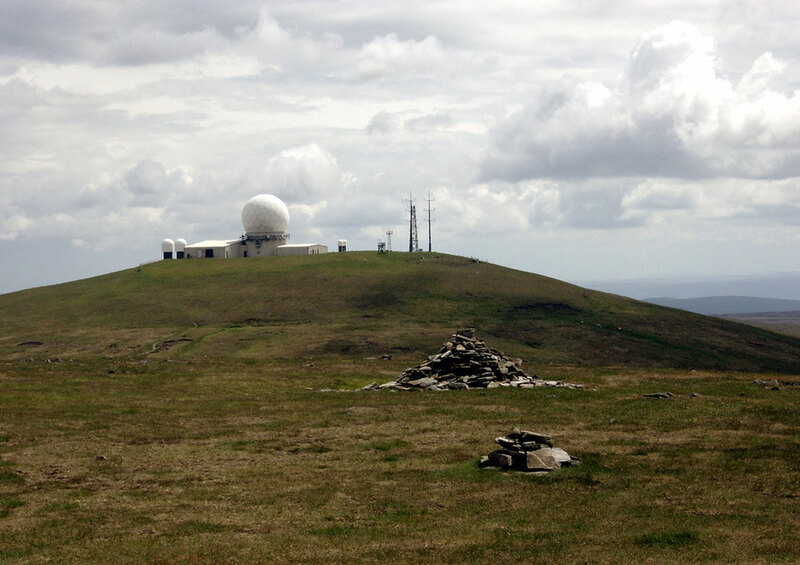 By 1.20 I was on the summit of Windy Gyle after a surprisingly hard time ascending the short rise from the ridge. There is a Geocache near here, but when I discovered that it would involve a half-mile walk back towards The Cheviot I left it alone. 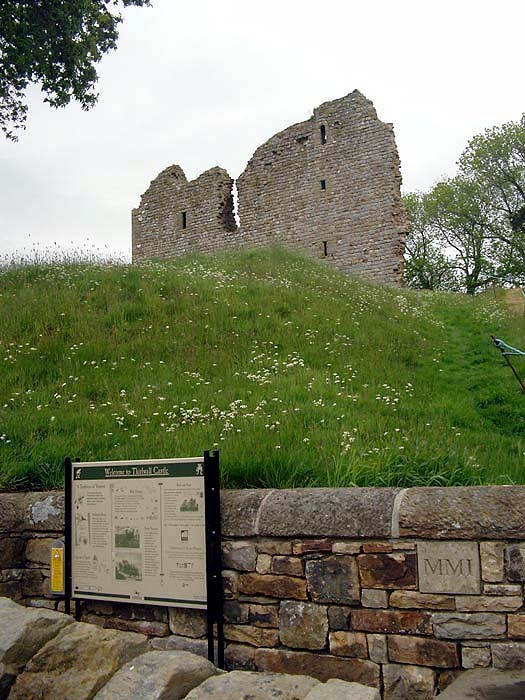 The cairn (Russell's Cairn) is a huge structure, almost a mountain itself, which dates from prehistoric times - the name is from Lord Russell who was murdered here in July 1585. The Cheviot ridge from Windy Gyle westwards meanders a little before it starts to spread out towards Byrness. At first, though, it is at its most defined as it rises over the summit of Windy Rig. I was not feeling good here, and had a rest stop of 20 minutes or so to relax and soak up the peaceful upland atmosphere. This became less peaceful with the arrival of three motorbikes , audible from a few miles away and leaving tracks visible on the ground long after passing. Their presence may have been legal, but the damage wrought on the peaty sections of the path was incredible. Six more bikes were to pass soon after. "keep plodding on, thinking of Scott's journey to the South Pole, until overcome by exhaustion, and then lie down and die". The latter option was starting to become more attractive by the time I reached the final sizeable hill of the day - the Ogre (well, Ogre Hill strictly speaking). After another rest, I plodded wearily to the top: had it been near the start this hill would hardly have registered but at this stage it was a big effort. By 5.15 I was on the top, then there was another short rise to the top of Raven's Knowe, and I called Chrissy at Byrness to tell her to expect me in an hour. Although the path from Raven's Knowe is almost all downhill, it is still an effort as there tends to be a flat section over rough ground followed by a climb down steep rocks, followed by the same again several times. The land around here was extremely swampy as well, with many areas where careful steps have to be taken to avoid going in over the knees in green swamp. An unexpected and unwelcome hill finally led to the last descent - a steep and awkward scramble through the forest on the side of Byrness Hill, which finishes in a ravine. 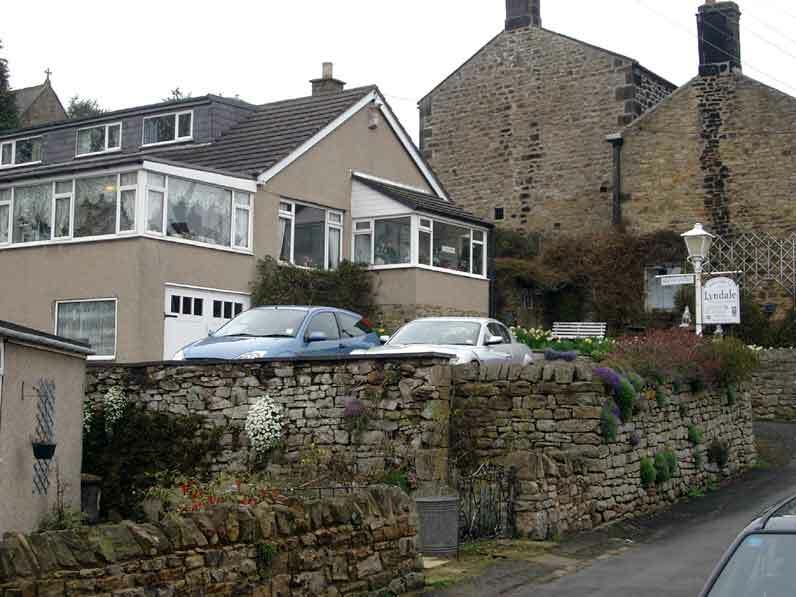 A short but very steep climb out of the ravine leads down to the road (the A68), and the sudden shock of houses and speeding cars. 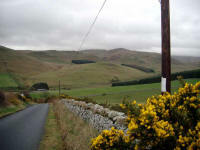 I have to admit to being very weary by the time I trudged up the seemingly steep drive to the Byrness Hotel. 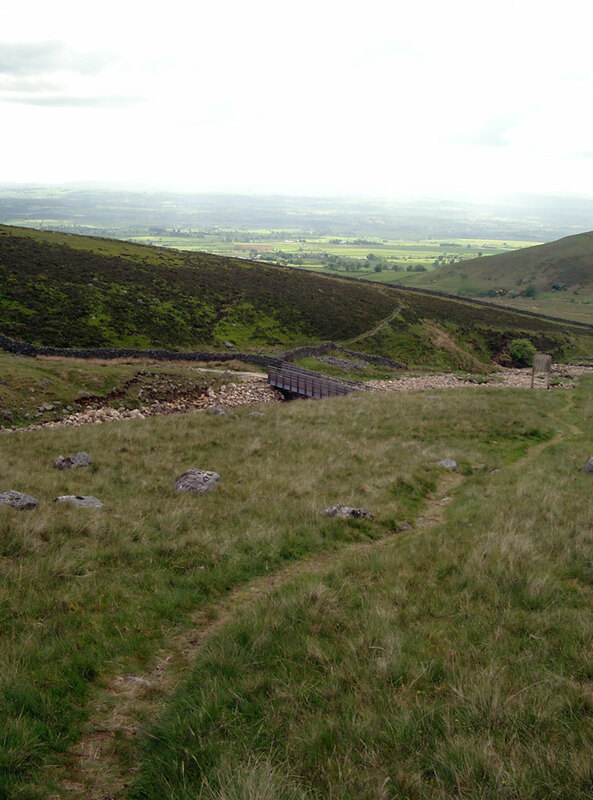 Although I was still capable of a few more miles before real exhaustion, hill climbing had become a real problem, I guess because I'm not used to it, not being a regular weekend hill walker. My legs throbbed for the next couple of hours - alcohol has a great soothing effect though and I was glad to get a good night's sleep in the rather disappointing Byrness Hotel. I was in no great hurry to start walking in the morning - fifteen miles with comparatively few hills sounded like a rest day after the Cheviot crossing, and it seemed more important to rest and conserve stamina rather than get to Bellingham early. So it was after 10 o'clock before I said goodbye to Chrissy and set off. It was a pleasant morning, mostly cloudy but with a few small breaks to provide a little optimism for the day ahead. 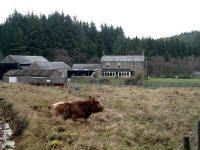 The first two miles are along the river Rede: a sheltered glen of trees and verdant clearings. At Blakehopeburnhaugh (the longest name on the Pennine Way! 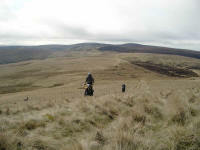 ), the track turns in to the forest - back to Southern Upland type country. An undulating forest track led SSW for another three miles: ideal for getting the day under way as an easy rhythm can be attained on the unobstructed, hard packed surface. 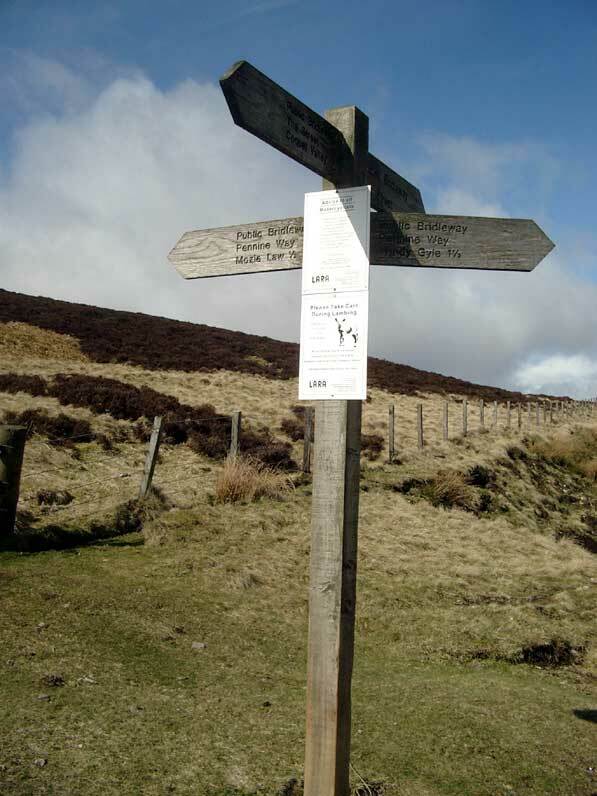 Just over a mile from Blakehopeburnhaugh, signs pointed off to the right, where the official route takes a parallel path along rough ground up a hill, then rejoins after about half a mile. I don't think there is any need to be pedantic when following a long-distance path - in cases like these, where the diversion appears illogical, it's better to ignore it and continue along the main track. That was my opinion at the time, anyway - nothing to do with just not relishing giving up the easy walking for an awkward little path, of course! In any case, the easy walking soon came to an abrupt halt. 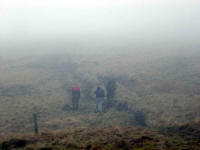 The fork to Brownrigg Head appeared to be a good wide path along the forest edge, but this was an illusion as it was really a narrow, winding and faint line through a very wet bog. After leaving the trees, the boggy ground continued up to the top of the hill: progress was in a weaving line with much stopping and starting to avoid the wettest ground. Although my feet were staying dry in the Gore-Tex lined boots and gaiters, it was heavy going underfoot and there was a good chance of sinking in above the knees if one lost concentration. 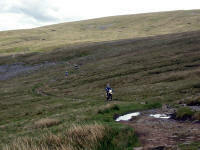 The ground was firmer over the top, but a steep descent into the Gorless valley was even wetter. I passed a walker here: the first of the day. By half past twelve I was climbing Padon Hill: at last firm ground. At the top I stepped over the fence and strolled across to the striking "Pepper Pot" monument. Sadly, the authorities are keen to close the footpath leading to the monument (I can't imagine why as it's the only striking feature in the area). I visited the geocache nearby (one of only a few which are within easy reach of the Way), then stood and had lunch of a few mouthfuls of water and some Kendal Mint Cake. Feeling fortified after this extravagant meal, I marched on to the road across moorland of short heather. 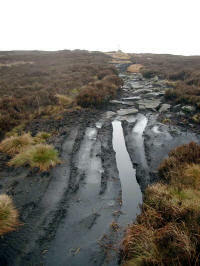 After crossing the road the path became very vague as it entered an area of peat bogs. 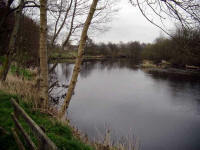 An elderly lady was sitting down near the stream which starts on Lord's Shaw. I spoke to her briefly - she seemed in great spirits considering her diminutive size and the enormous pack she had obviously been carrying. The sky had turned grey and a chilly breeze was blowing, so I remarked that the weather was not so good, but apparently the previous day she'd been caught in a hailstorm and had to walk against high winds. She didn't mind that, but she'd invited a friend along for the day who was not so impressed with the walk under those conditions. The featureless moor of Deer Play followed. At first the line was difficult to find, or perhaps I was a little off-route because eventually I reached a wide, rutted track. This is one of the sections which is severely damaged by off-road vehicles, a great pity as it makes the path a difficult and unpleasant unpaved roadway although the surroundings feel wild and natural (of course, they are man-made but still with a wilderness feel). I passed a group of young backpackers on the descent to the B6320, who warned me about the boggy "alternative route" ahead. This takes a more direct line from just west of Hareshaw House to the knoll above Bellingham, but unfortunately doesn't lead to Hareshaw Linn. 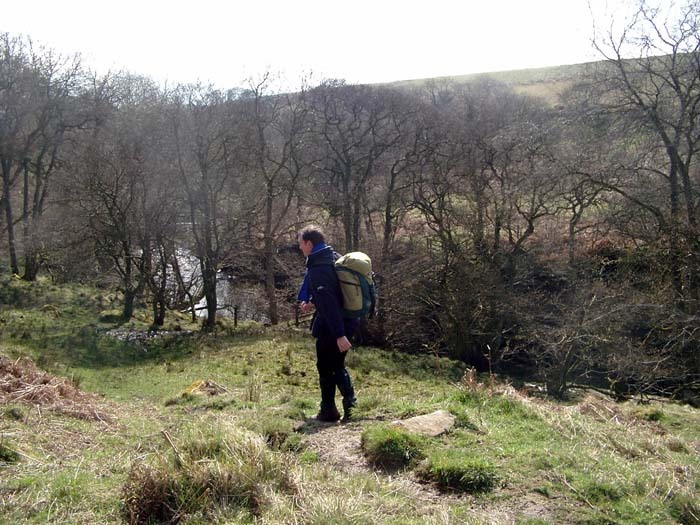 The path from Hareshaw Linn to Bellingham was the original line of the PW, but now it stays further east, (whether or not you use the alternative) which is a great shame. 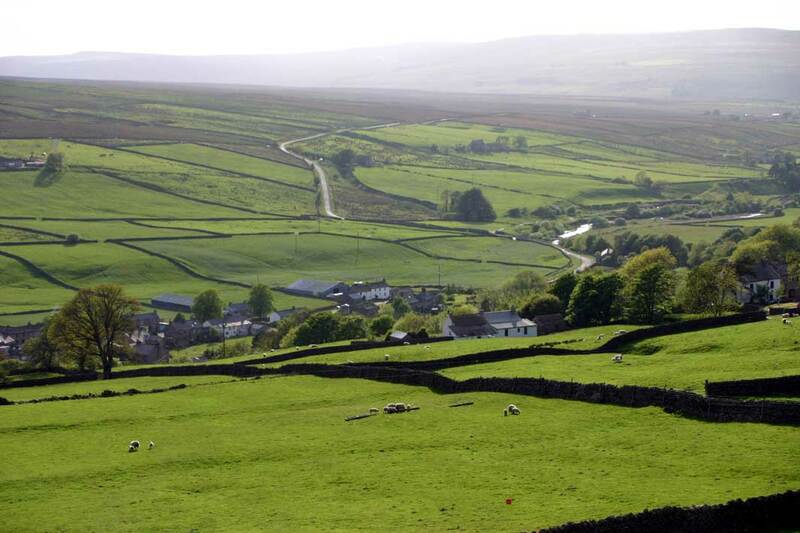 The alternative route was a non-starter for me - I'd had enough of boggy ground anyway, so I turned left and up a short rise to the Hareshaw House lane, past a shepherd on a quad bike (as they all are around here) busy with his dog and a difficult-looking flock of sheep. 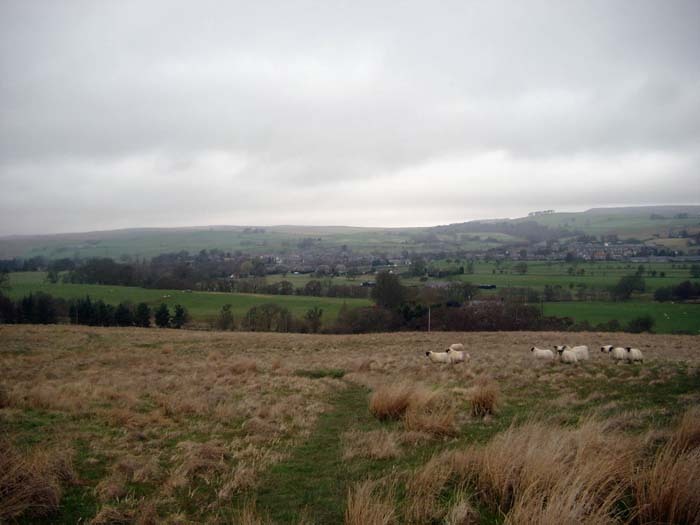 Hareshaw House has a riding school, and the field before the lane contained several horses. I've started to get used to cattle in fields, and rarely feel worried, but horses are nippy enough that I'm always a bit wary in case one gets a bit too frisky - I don't like the idea of flying hooves. After crossing a stream, the path gets very vague and I stuck to the GPS heading across more boggy ground until the better grassland of the knoll appeared. 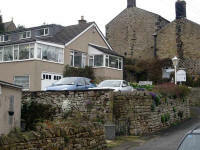 A descent through the farm of Blakelaw led to the quiet back lanes of Bellingham. 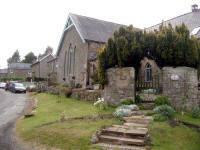 I soon found the Lyndale Guest House, just off the village centre. and was at the door by 3.45. Chrissy was already in residence, sitting in the conservatory with tea and biscuits. The hosts Joyce and Ken soon made us feel very welcome, and I made use of the spa bath to wash away the grubbiness of the walk. There was no evening meal at the Lyndale, but that was no problem as it gave us the opportunity to have a look round the village. On a recommendation, we walked a short distance out of the village to Riverdale Hall, a hotel and restaurant. 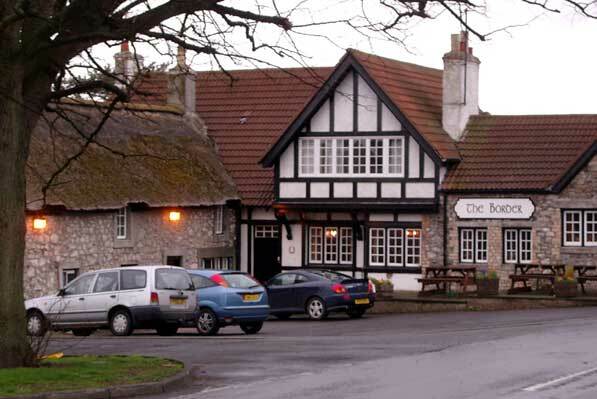 This was a good decision as Riverdale turned out to be a perfect place to dine, with fantastic food, great real ales and excellent wines, with a smart but very friendly and casual atmosphere. The head waiter tried to persuade us to stay late as they were having a disco, but I decided that we'd be better off with an early night (perhaps I'm getting old!). I think we'll be back to stay here one day. We sat and ate a good cooked breakfast in the Lyndale, then I gathered various water bottles and items of spare clothing together and prepared for the day ahead. I had a pair of new Meindl boots with me but hadn't risked using them yet. With a moderate day ahead, I decided to give them a try. 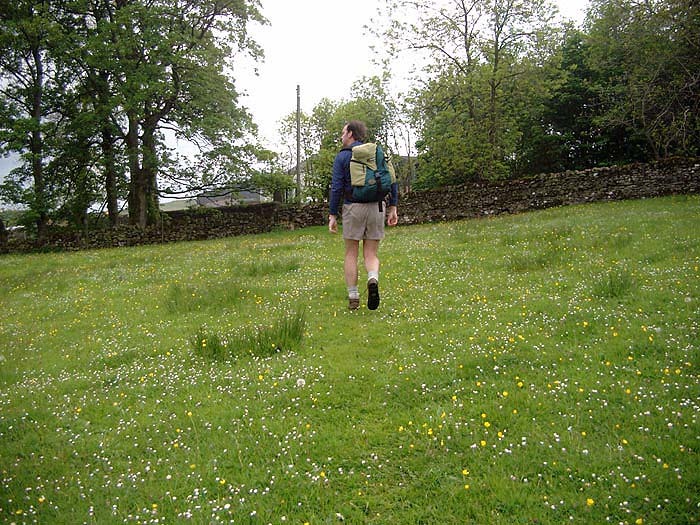 I carried my well-worn Brashers in the rucksack as an insurance policy, as although the Meindls felt comfortable I'd had experience in the past of the way comfort can turn to pain in a few miles! The Lyndale is actually on the Pennine Way, so I only had to step off the front driveway to continue the E2 walk, at 9 a.m. The street led down to the River North Tyne, which was placid as I followed the bank for a short distance to the B6320 bridge. Crossing the river by this bridge, the next mile was road walking and led pleasantly to a Pennine Way sign at a stile. The new boots were comfortable except for a slight ribbing on the right ankle which I decided would probably disappear as I warmed up. The weather had begun fairly brightly, but as the path led up Ealingham Rigg heavy grey clouds took over and a chilly breeze made its presence felt. At the top of the hill I stopped to wrap a scarf around my neck and have an attempt at readjusting the uncomfortable boot. 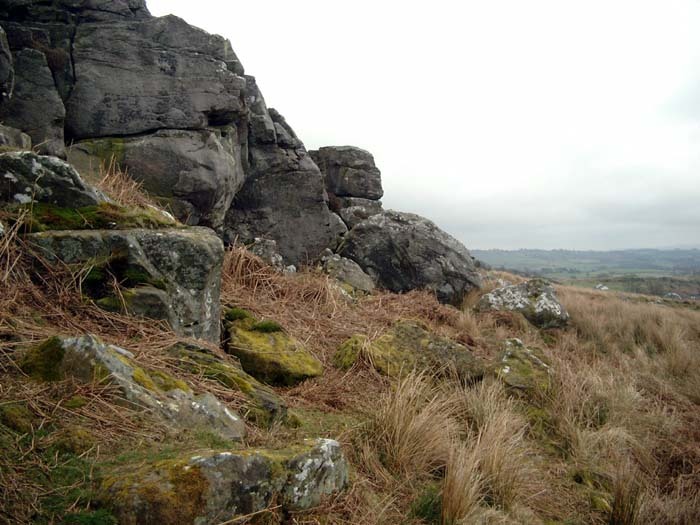 The prominent rocks of Shitlington Crags were the next landmark, followed by the muddy Shitlington Hall (Wainwright called this name "a trifle earthy" - it was originally "Shotlyngton Hall"). Navigation was becoming more complicated as there are more small fields around here and PW signs are not abundant. I had to find a way through a barbed wire fence after taking a wrong decision, but was soon crossing the Houxty Burn and up a steep hill onto Wark Common. A lane led to more open ground, then another lane led down to the beautiful, sheltered farmsteads of Linacres and Lowstead, resplendent in morning sunshine and spring flowers. The Way passes right through the garden at Lowstead, which was quite a haven after the bleak uplands I'd been getting accustomed to. After another mile I was crossing Warks Burn by a scenic footbridge, the sunshine and vegetation giving a fair impression of a summer day. Just beyond the Warks Burn I stopped to remove the scarf and the by now painful boot. As the left boot was completely comfortable I was loath to interfere with it, so I exchanged the right Meindl for the right Brasher and walked on in odd footwear. 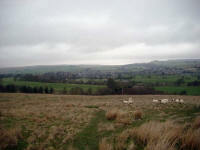 The next section was back to upland country with a slog up the hillside to the north Wark Forest. A good track then leads through the forest to a road near Willowbog, then through more forest to open ground on the Black Law ridge. A grassy open section with only a faint path then heads south-west to the edge of another plantation. I was now 10 miles from Bellingham, at 12.39 p.m. 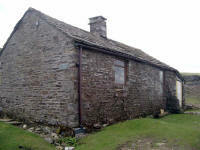 This plantation is Wark Forest South, the last of the forestry sections on the Pennine Way. 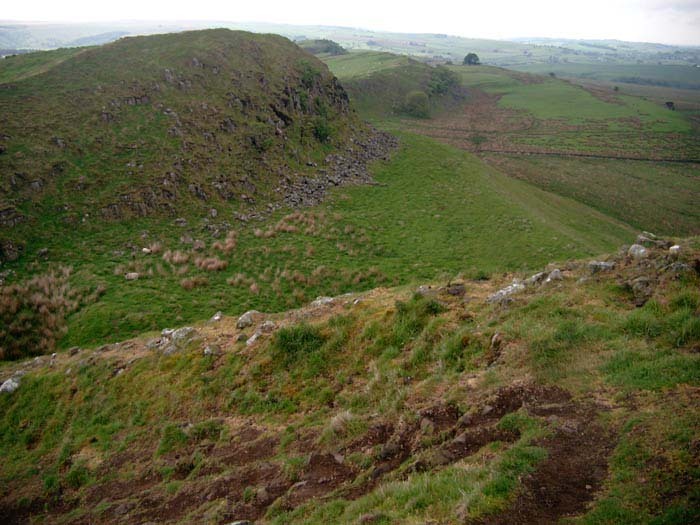 On leaving the plantation, the landscape suddenly opened out with two ridges ahead, one of them the famous Whin Sill with the Roman Wall on top. The approach to the wall seemed very long although only a mile and a half from the edge of the forest. I had not been walking smoothly, and the painful ankle did not help: I was wishing I'd removed the Meindl boot earlier as the Brasher was rubbing the sore area left by the new boot. By the time I reached the top of the wall, I was feeling quite weary and didn't really relish the sharp undulations I was expecting along the next few miles. 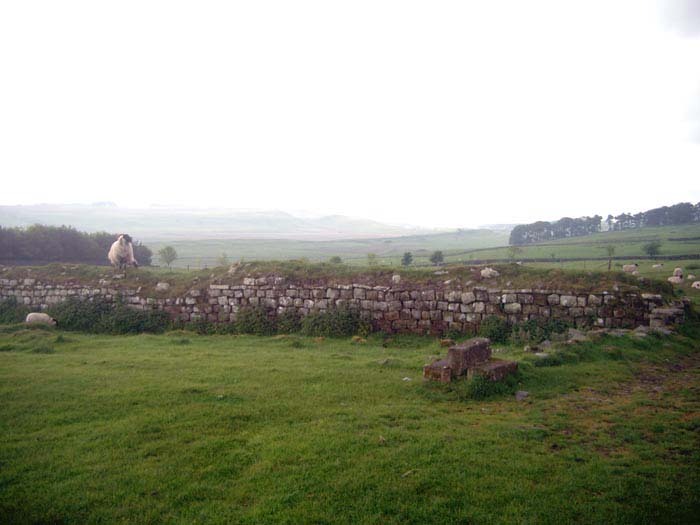 However, the weather had turned warm and sunny (at last) and the views along the wall were superb. 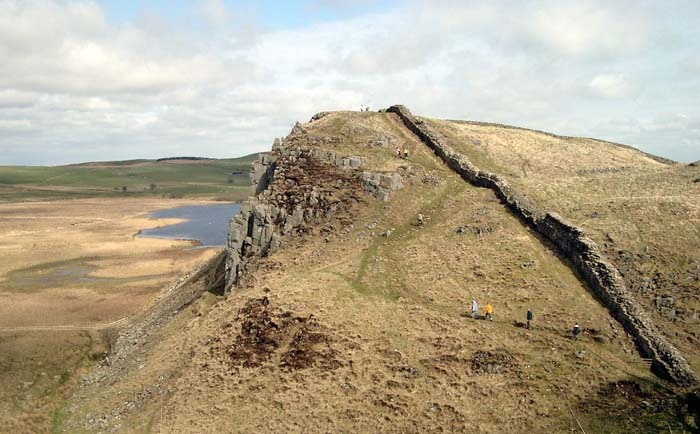 I'd made good time: I'd arranged to meet Chrissy at Cawfield Quarry at 4 and this looked a reasonable schedule with plenty of time to enjoy Hadrian's Wall. 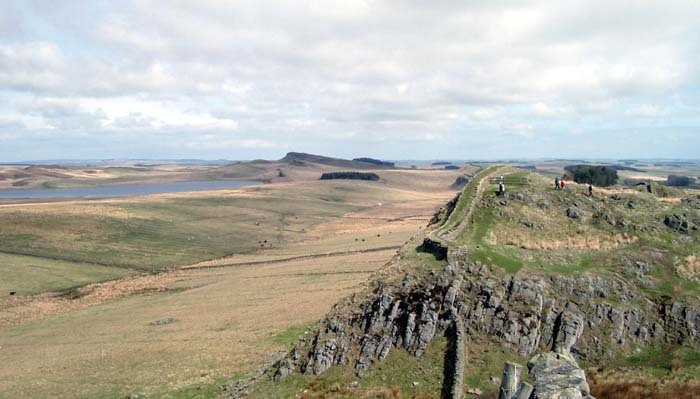 It was an enjoyable though tiring 5 miles along the wall - it was good to see plenty of people enjoying a stroll, and there were several highlights such as the aerial view of swans nesting in the reed beds of Crag Lough. I had considered waiting for Chrissy at Cawfields, then walking on another couple of miles to reduce the mileage of the next day, but the painful ankle and a general weariness led me to consider planning a rest day instead of a shortened day as I sat at the Cawfields picnic site and waited. There is no mobile phone reception at Cawfields, and for once there was no sign of Chrissy. Half an hour went by and I drank the last few drops of my water supply as I waited (no ice cream van, unfortunately!). 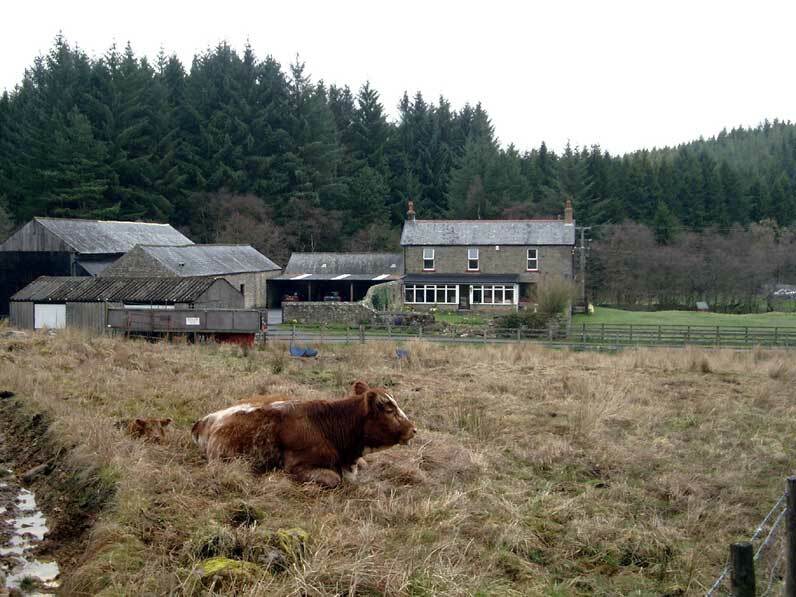 Eventually she appeared, having been confused by the roads from Hexham and Greenhead, and we made our way to the next B&B, at Broomshaw Hill Farm, just north of Haltwhistle. 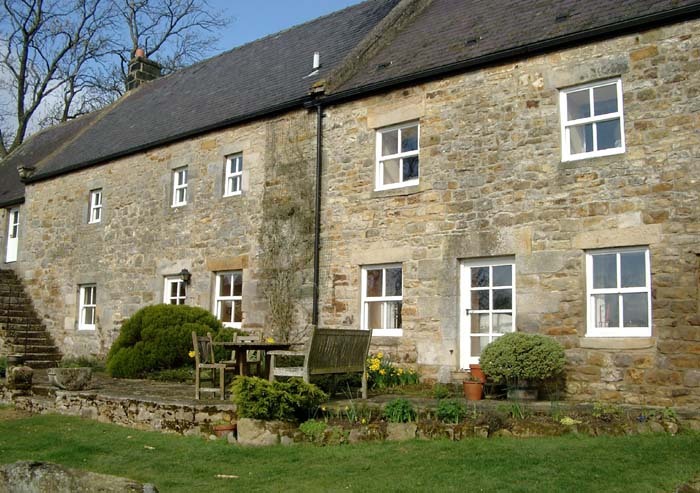 This is another recommendation: a fine old farmhouse with comfortable and spacious rooms and an air of grandeur. 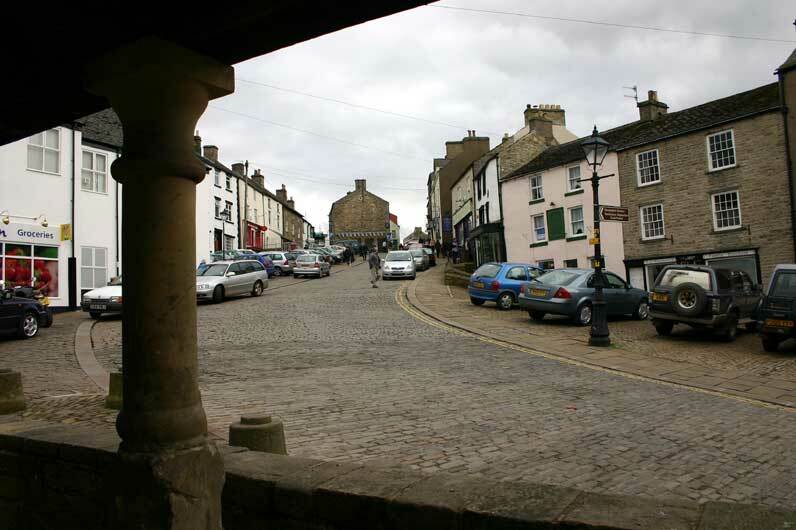 We drove down to Haltwhistle in the evening, and had excellent fish and chips in the parlour at the back of the chip shop - a contrast with the previous night, but almost as good! We then had a quick pint in an excellent small pub tucked away just off the market square: good beer and a cheerful atmosphere made this one to recommend (although I forget the name - it's the one behind the Indian Restaurant!). I decided to take a rest day, in fact I had two rest days, on 12th and 13th April. The dilemma I faced then was whether to continue from where I left off (i.e. 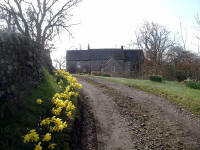 Cawfields), or continue from where I should have been by then (Dufton). I went for the latter option as this had the advantage that I didn't have to re-book accommodation. 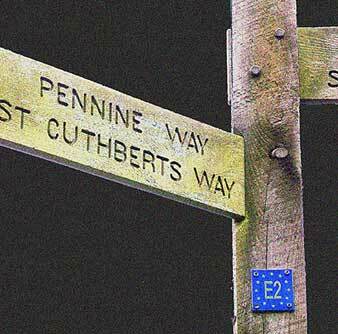 The down side was that I'd have to leave a gap of about 40 miles, which I'd have to walk later. I didn't want to do any section out of sequence, but felt that this was the best compromise. So I returned on Saturday 29th May to fill in the gap - it's easier for the reader if this is fitted into geographical sequence, however. This time we used the Douglas to Heysham ferry, arriving in Heysham at about half past eleven in the Friday night. 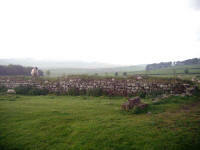 We stayed in Morecambe for the night, then drove the 90 miles or so to Hadrian's Wall in the morning. This meant quite a late start: it was 10.35 before I was under way again from Cawfields picnic site. I started walking in light drizzle, but the weather soon picked up and the waterproof trousers were quickly jettisoned in favour of shorts. An enjoyable four miles led up and down the fading escarpment to the ruins of the 14th century Thirlwall Castle, which overlooks a few beautiful cottages nestling in a dale. Busy looking at the castle, I made a navigational error here which led me down to the hamlet of Longbyre, adding half a mile to the route as I had to walk back along the road to pick up the PW again. I'd asked a ranger for directions at the castle, but he didn't seem to know which way the way went at all - I'd already missed the turnoff by then. The path led steeply up from the road to Haltwhistle Golf Club, and across the course itself. A friendly golfer gave me directions to negotiate the fairways, and by half past twelve I was crossing the A69 - a very intimidating stretch of busy road. A good track led up the hillside through light woodland, to a turn down a bleak lane. I cut the corner slightly by walking through a field of cattle: only when I approached the bull did I notice it. He was a big fellow, but no horns and I continued warily, assuming that the bull could not be too dangerous if left grazing next to an unfenced footpath. I was glad to get over the gate and out of the field, however, and on to the more familiar Pennine upland of Blenkinsopp Common. 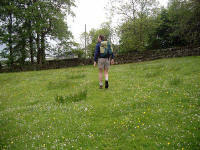 For the next few miles the path was faint and the ground rough: featureless grazing land. Wainwright called the next section "tedious and complicated": you're not inspired by anything, but you have to maintain vigilance to navigate efficiently through the fields on vague tracks. 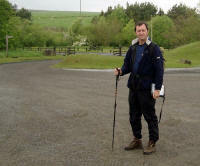 I stopped for lunch (of Kendal Mint Cake) at Batey Shield, a farm about nine and a half mile from the start. It was sheltered and warm, but I had to retrace my steps for about 50 yards as I'd missed another turnoff. After another mile and a half, the ruins of Lambley Colliery appeared, and I crossed the A689 onto Lambley Common. The Way crosses heather moorland here: the hills have risen up again after the crossing of the gap between Cheviots and Pennines, and at last I was genuinely in the Pennines. The track follows the Roman Road (Maiden Way) for a few miles of fairly uninteresting but straightforward walking, then drops down under the railway viaduct at Burnstones. The next section to Slaggyford was very complicated to find, so it was slow progress - if the Way had been amended here to follow the railway track it would have been much improved. 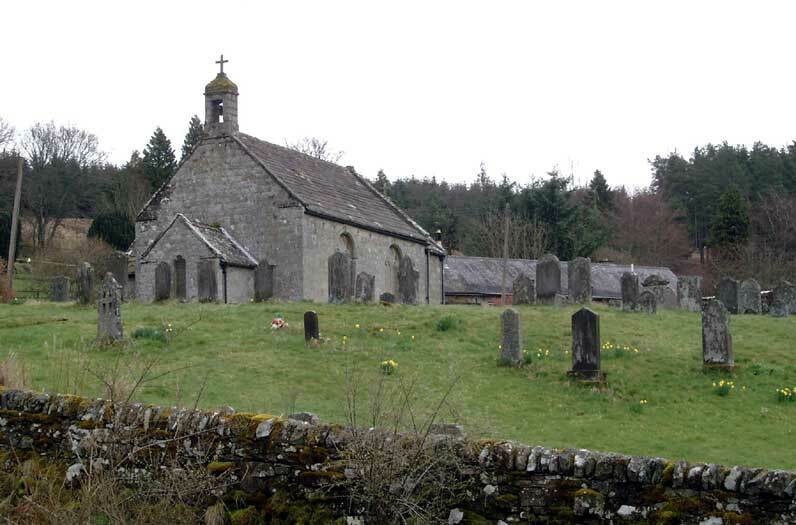 Despite the grim sounding name, Slaggyford is a very pleasant village, although without facilities. A good riverside walk along summery meadows then led to another railway viaduct at Lintley. Here the PW takes an undulating parallel course to the railway, and I opted to walk along the disused track bed itself - much better. There were hundreds of rabbits in sight as I marched along to the existing steam railway station at Kirkhaugh. 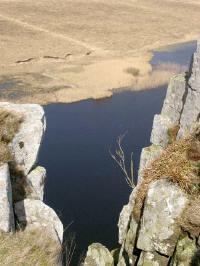 Here I crossed an unstable-looking stone bridge to rejoin the official route for a short distance. On reaching the main road, I transgressed again: after 19 miles I didn't really see the point of the diversion up the hillside and back down again, and kept to the road until the Way crossed the road again at Harbut Law on its way down to the South Tyne. A gentle walk along the river bank then led easily to the bridge at Alston and the waiting Chrissy (I was five minutes late). We stayed that night at the best place so far: High Windy Hall. 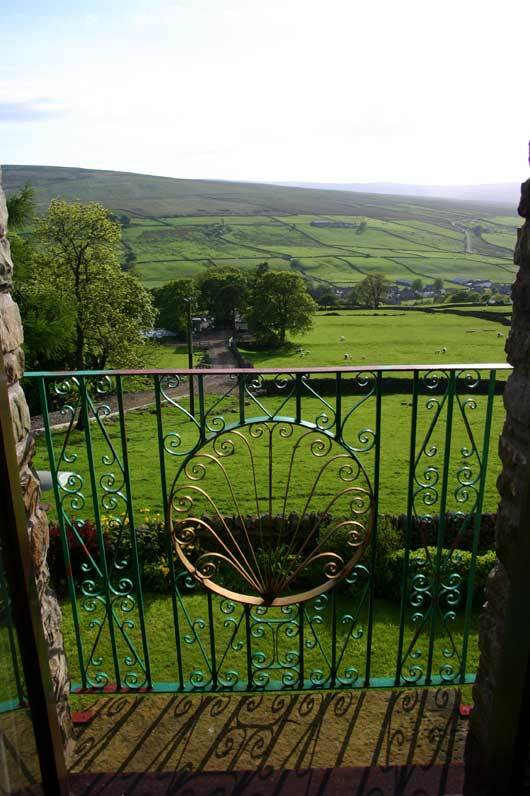 We had a superb room with a balcony overlooking the Garrigill valley, and on a fine calm evening we had the windows wide open and could hear the shepherd bringing in the local flock. 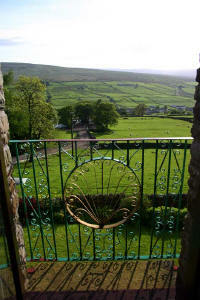 Dinner was superb, with a table looking out to the setting sun over Cross Fell. The couple we chatted with were interesting as well: the lady was rather elderly and infirm, but clearly frustrated that she could no longer climb the mountains she still loved. Chrissy dropped me off back at the bridge over the South Tyne at Alston: although we stayed only a short walk from Garrigill I couldn't cut out the four mile walk up the valley - I might not be pedantic about the continuous walking but I want to avoid leaving any significant gaps, as I enjoy the feeling of having made the whole journey on foot. As we were heading south after today's walk (by car, I mean! 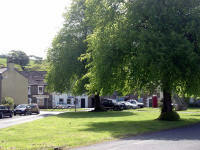 ), we arranged to meet at the pub in Dufton at four o'clock. 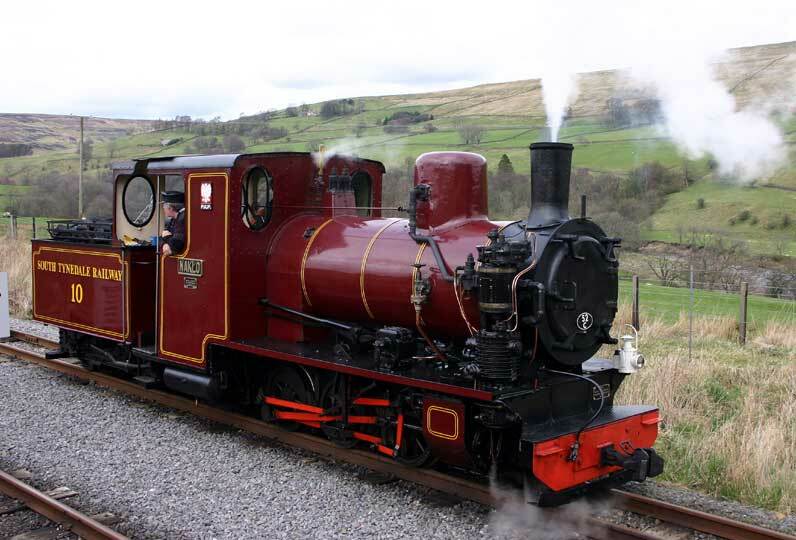 As it was after nine by the time I set off towards Garrigill, and with the highest hill in the Pennines on the itinerary for the day, I had to take advantage of the straightforward section to Garrigill. This was a pity, as the valley is very attractive here, and the weather was warm and sunny. Although the route looks very simple on the map, it's a little confusing in places and I wandered off the footpath a couple of times. The crucial footbridge was found fairly easily, though, and I was welcomed to the outskirts of Garrigill by a couple of herons. On such a fine morning, even the spoil heaps on the edge of the village seemed pleasant, and the village itself is quite a gem, with a lovely big green surrounded by well-tended cottages. It was tempting to dawdle here, so it was a good thing that it was too early for the pub to be open. 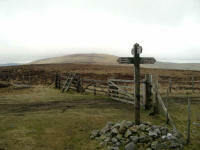 Actually, I was keen to get on with the ascent of Cross Fell: a mountain which has been on my list for a very long time. I was expecting a hard climb for the first couple of miles, but in the event the track was good and the gradient steady and I was soon up on the wide open space of Long Man Hill. The track over Long Man Hill, with Cross Fell behind. The next few miles were a steady grind on a fairly level gravel track. The only difficulty was that the track surface consists of stones which have been loosened by the passage of vehicles so that footing is often awkward. A sudden rise led to over the magic 2000 foot mark, and the track contoured round at about 2300 feet until the prominent shelter of Greg's Hut: part of one of the many old lead mines around these slopes. Here the peaceful scene was interrupted by a group of bikers - I guess the reason for the track being so stony. The group stopped at Greg's Hut, and I feared that they were going to head for the summit but luckily I never saw them again after I left the hut. 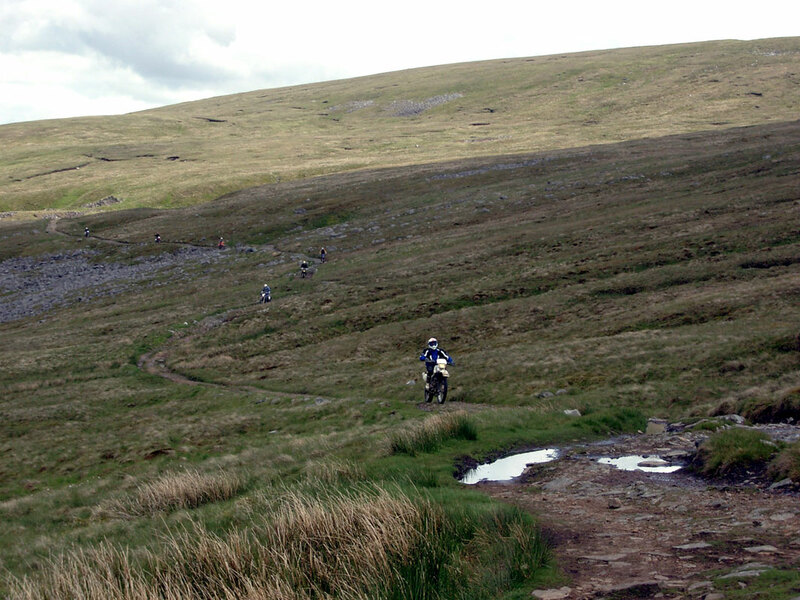 There were plenty of tracks and gouges in the wet hillside above, however, and it's obvious that Cross Fell is a popular destination for the bikes. Elsewhere I have a special web page with examples of how the Pennine Way is being destroyed by off-road vehicles, so I won't rant about it here! 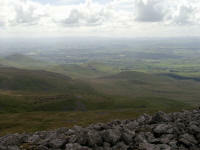 A laborious mile from the hut and I was on the summit of Cross Fell. 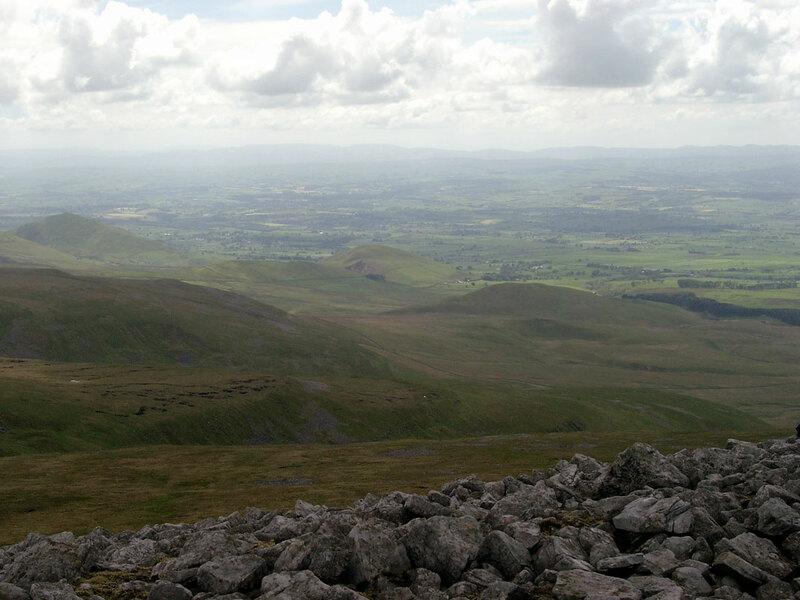 It was a good, clear and bright day and the view across the Eden Valley was spectacular. Although the summit is flat and dull, you have a feeling of being on the roof of the Pennines, as this is the highest point at 2930 feet (893 metres). I took a direct line towards Tees Head from the top: the path actually goes east before dropping through the screes, and I ended up having to cross an awkward bolder field to reach it. 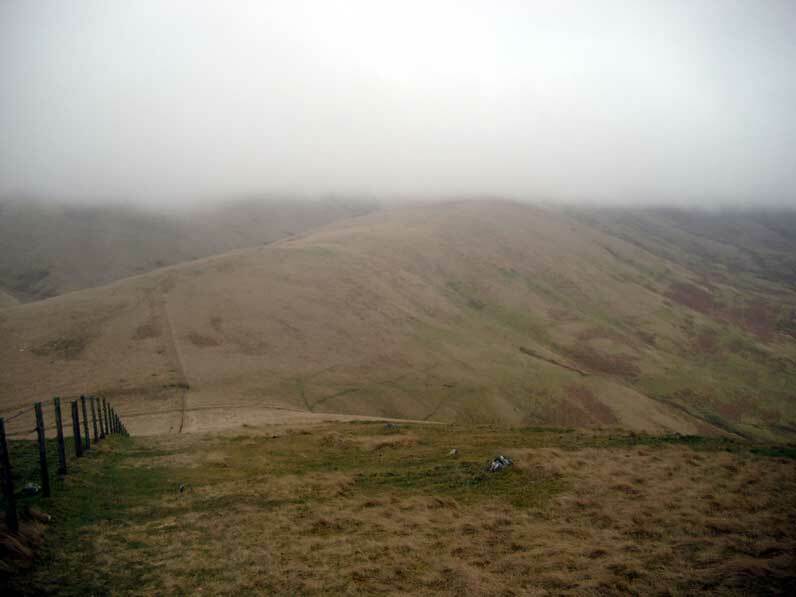 The path along the ridge to Knock Fell was a very enjoyable, airy experience with great views of the populated lowland on the right and the vast wilderness on the left. the path here was very popular as well - I'd only seen one walker from Garrigill to Greg's Hut, but now I was passing people all the time. 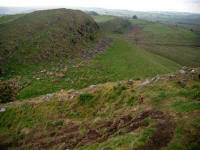 Soon Little Dun Fell was crossed, and the desecrated Great Dun Fell loomed. 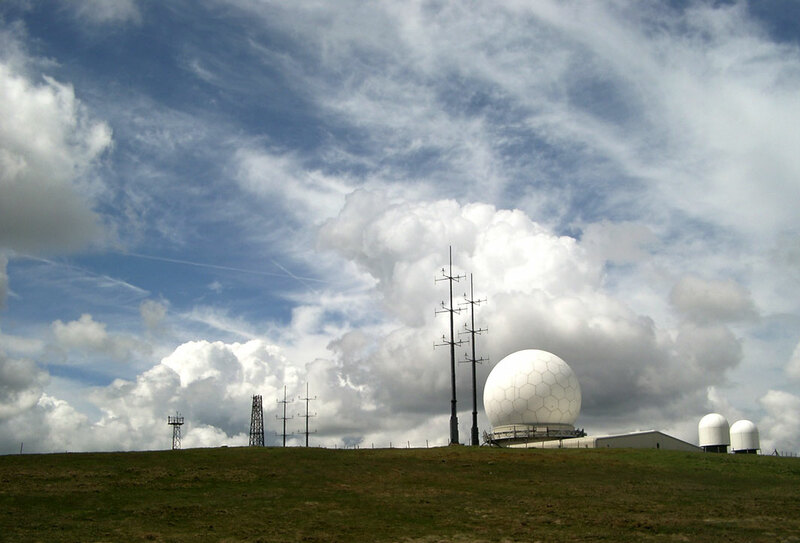 The path skirts the radar station, and reaches the road just to the south-east. Perhaps one day the fell will be clear of its paraphernalia, until then we have to tolerate it. At least it means that England has a high road - the road here is tarmacced, and joined briefly at the height of 2500 feet. 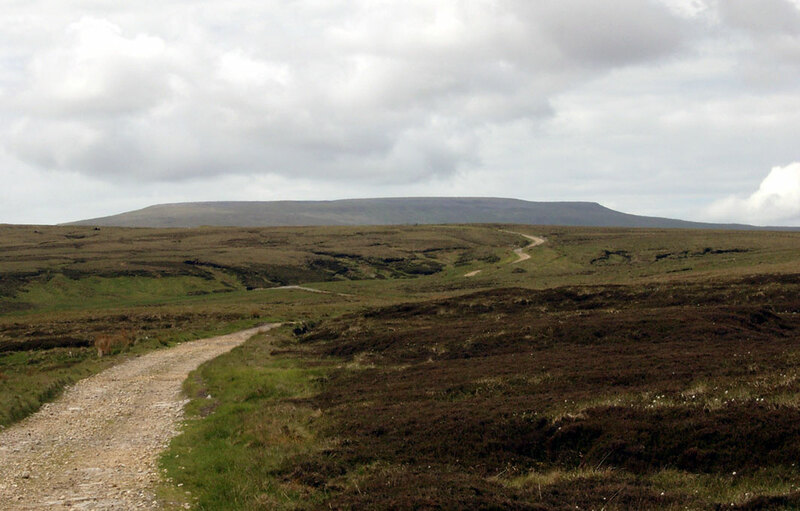 Knock Fell is more typical of the Pennines, a rounded peaty lump. 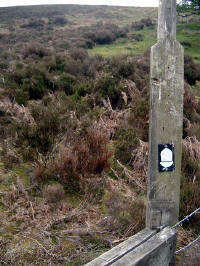 The path turns south west here, to a prominent cairn on the edge of the descent to Knock and Dufton. I stopped for fifteen minutes at the cairn, removed boots and socks and treated a few area that were starting to rub a little. This was a good move, as my feet then felt perfect and I ran down the hill. I was at the cairn at 2.40 p.m., and two miles further on at Swindale Beck by 3.05 after a very enjoyable wild scamper down the hillside. 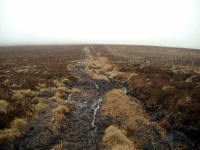 The beck must have enormous spates as it was a huge area of gravel with hardly a trickle at the bottom. From here the Way became less and less rugged, until I arrived (in a shower of rain) in the leafy fields on the edge of Dufton. 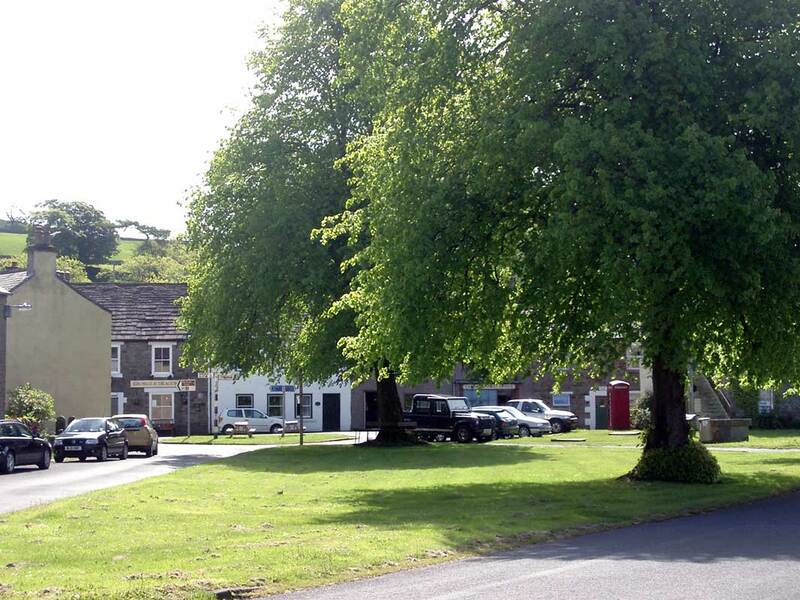 I made it to the village green by four o'clock, where I met Chrissy and we had a drink in the village pub before setting off for South Wales (the Third Division Playoff Final was the next day and couldn't be missed! ).